City management is critical to your success, because there are four ways to win the game and it will take a directed effort with different priorities and paths to achieve victory through conquest, cultural dominance, economic might, or technological achievement. Of these the military victory is easiest to achieve. You'll be able to conduct a little diplomacy with the other civilizations in the world, the main point of which is to form alliances. However, the other civs will inevitably begin to demand money or technology from you in order to continue honoring the alliance, and refusing to pay will thrust you into war. So even if you're trying to become an economic powerhouse you'll find yourself inevitably fighting a series of wars. There aren't nearly as many different unit types in Revolution as there are in a typical Civilization game. However, there are enough that you'll have to be smart about how you use your units. Each unit has its own attack and defense rating which can receive additional modifications from things such as terrain, fortifications, and veteran status. Battles are initiated by moving a unit onto an enemy unit, after which things are auto-resolved by the game. While you can stack a few of the same type of units and form an army, you can't do so with a mix of unit types. Later in the game in can take a while to move all of your forces each turn, and battles can take some time to resolve as you need to move one unit or stack at a time into battle and wait for the fighting to be resolved before you move the next one in. The game does have a multiplayer aspect, but this is not a fast-playing game in single player and not much is done to speed up the game in multiplayer. Multiplayer is fun, but unless you have large blocks of time to devote to it, you'll probably play through a single game on your own over the course of a few evenings. The game also has a number of scenario modes which change up the rules in one way or another, but they are not designed for quick play either. There's no real way to sit down and quickly play through a couple of games of Revolution, but those who have the patience to play through long games will be rewarded by an enjoyable experience. In The End, This Game Hath Been Rated: 86%. 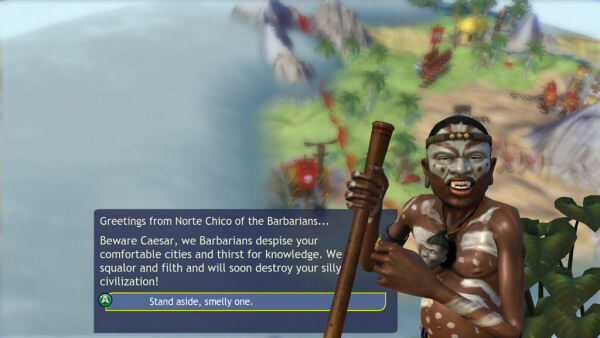 Civilization debuts on consoles with a bang.